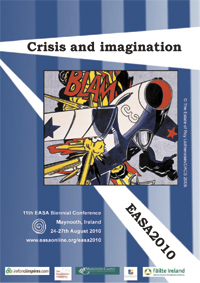 EASA and Department of Anthropology at the National University of Ireland Maynooth hosted the 11th biennial conference. The conference attracted over 1100 academics to discuss work based around the theme. There were plenaries, workshops, a keynote, a roundtable, network meetings, publishers, dinners, pubs, Irish music and much more. The keynote was given by Prof. Talal Asad, on Human atrocities, human rights. If you didn't take my advice about boating to/from Ireland.. The Wenner-Gren Foundation grant and thte EASA travel fund gave us €20,000 to support delegate attendance . Funding could cover registration, University accommodation, and travel, but not membership subscriptions. 279 people applied for over €156,000. We allocated funds to 68 people, prioritising those coming from poorer economies and students, as well as those convening a workshop or presenting a paper. These 68 comprised 29 convenors, 63 paper-givers, 33 long term EASA members, 42 women, 26 men, 46 below 40yrs old, 16 above, 5 from Latin America, 3 from Asia, 2 from Africa, 34 East Europeans, 60 registrations, and 215 nights of accommodation. Refunds should reach accounts in the third week of August. The Moving Anthropology Student Network conference will took place 18th-22nd August at Maynooth. Steve Coleman, Abdullahi El-Tom, Pauline Garvey, Mark Maguire, Michal Buchowski, Manuela da Cunha, Maria Couroucli, Paolo Favero, Gísli Pálsson, David Shankland, Dorle Dracklé, Thomas Fillitz. Steve Coleman, Abdullahi El-Tom, Pauline Garvey, Patty Gray, Anthony Kelly, Karen Kelly, Mark Maguire, Chandana Mathur, Tom Strong, and Karolina Szmagalska-Follis.